Find answers to a few frequently asked questions. If you don’t find what you’re looking for, we’re always happy to speak to our customers. 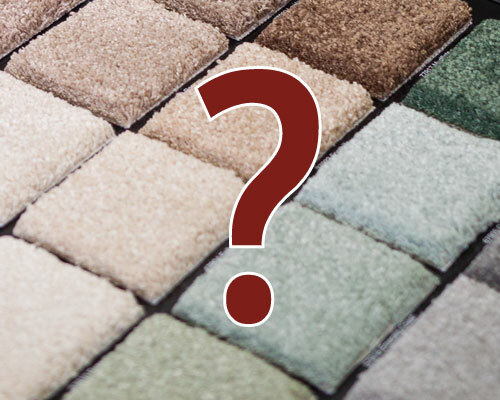 Contact us today and we’ll answer any flooring questions you may have. 1. WHAT ARE YOUR SHOWROOM HOURS? Mon & Sat: 10:00 a.m. – 5:00 p.m.
Tue -Fri: 10:00 a.m. – 6:00 p.m. Call our showroom for warehouse hours and installation schedules. 2. DO YOU SELL AREA RUGS? Yes, a number of our manufacturers offer area rugs from style samples that are available for you to borrow. We also have a binder on staff, enabling us to cut-to-order and bind, or serge most any carpet into an area rug or runner in almost any size or configuration. We also carry a wide variety of luxury and imported area rugs from Jaipur. 3. DO YOU DO FREE ESTIMATES? Estimates are free to our customers. We take a deposit at the time the estimator comes to your home and then credit that amount to your bottom line. 4. HOW LONG WILL IT TAKE BEFORE MY FLOOR IS INSTALLED? Installations are always based on product availability. The average duration between placing your order and installing your flooring is approximately 7 to 10 business days. However, we offer some stocked products which can be installed within days of placing your order. 5. CAN MY NEW FLOOR BE INSTALLED OVER RADIANT HEAT? Although most products today can be installed over radiant heating systems, it is imperative that we are made aware of radiant heating through all phases of your purchase. Because products react differently to temperature variations, product selection, acclimation and warranties may be affected. 6. CAN I PURCHASE FLOORING FROM YOU IF I INTEND TO INSTALL IT MYSELF OR HAVE MY OWN CONTRACTOR? Yes. Absolute Flooring works closely with many of the local contractors and are happy to provide “Cash & Carry” services for your flooring needs. We do ask that you or your contractor determine precisely what you need at the time of your order, as there are strict guidelines and restocking fees involved when making product returns. 7. HOW DO I GET STAINS OUT OF MY CARPET? Although virtually all carpets are treated for stain resistancy, it is important to follow manufacturers’ instructions for stain removal. Consult your warranty information or contact the consumer help line for the manufacturer of your carpeting or stain resistancy provider. Contact your sales person if this information is not readily available to you. When spot cleaning, blot with cold water and a light colored cloth (try not to use paper towel as this may set the stain). 8. HOW DO I CARE FOR MY NEW FLOOR? See our brochure for general care instructions. For further or specific information check your warranty brochure, call the manufacturer’s customer care number or contact our showroom during business hours for assistance. Absolute Flooring stocks most manufacturer-recommended cleaning products. 9. DO YOU REPAIR FLOORING? Yes, we do provide repair services. Call our showroom during business hours to discuss the necessary repairs, pricing and scheduling. 10. DO YOU REFINISH HARDWOOD FLOORING? Absolute Flooring sells & installs pre-finished hardwood floors. However, for your existing hardwood flooring, we do recommend some local contractors and would be happy to pass on their information if you’ll call the showroom during business hours. 11. DO YOU CLEAN CARPETS? Although Absolute Flooring does not provide cleaning services, call our showroom during business hours and we’ll be happy to provide local referrals for either routine cleaning or restoration services. 12. DO I TIP THE INSTALLERS? Most people do tip the installers, as with most service providers. The amount should reflect your satisfaction with their work and is always gratefully appreciated.